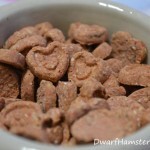 This page compares different commercial hamster food. If you are looking for fresh food to give your pet hamster, please use this food list instead. Here are some hamster food that are sold in pet stores. The protein, fat, and fiber content are listed when available. Keep in mind that manufacturers may change the ingredients of the food (and thus the nutritional composition) from time to time. We’ll be adding detailed reviews of each food later and will link to them from this chart. New food will also be added from time to time. My dwarf hamster Mickey enjoys running in his hamster ball. Hamsters sometimes get very frightened if they are put in a round sphere, but he doesn’t mind it, occasionally stopping and looking around instead of digging at the sides to try to get out, which is mistaken by hamster owners as the hamster running around in glee. I purchased the hamster ball a few months ago, and was interested because it is a glow in the dark version. I am sure children get a kick out of this part, but I don’t really think the average hamster owner lets her/his hamster run around in the dark, which is what this requires. Anyway, this is what the ball looks like. The ball is a dwarf hamster size, but it looks like it comes in larger sizes too. The cap that goes on the ball is softer plastic and therefore easier to break, and when I accidentally dropped the cap on the floor it confirmed this. Otherwise, the ball is pretty good in shape and the crack did not pose any danger to the times when I put Mickey in the ball – meaning, it did not get loose or open up once. There are good-sized slits in the hamster ball, but the hamster claws and legs did not get stuck in here once. My other hamster ball had to be disposed of because of this problem – the holes were big enough for his legs to become trapped and he could not enjoy the hamster ball time. My hamster had a very easy time rolling around, and the ball has great lightweight plastic that makes for easy rolling. As for the glowing part, I was a little disappointed. In dim light, it did not glow. 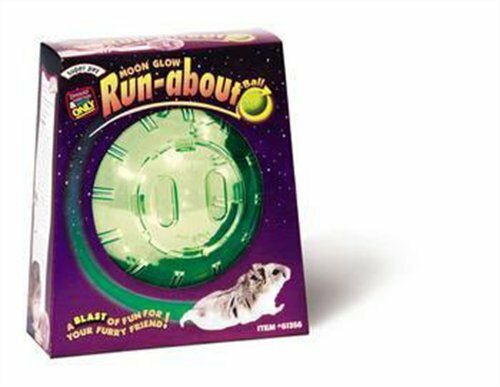 I think the whole reason people buy this particular hamster ball instead of the plain kind is because of the whole “Glow in the dark” thing, but you really must leave it under bright light all day to “charge” it, then make sure it is completely pitch black in order to see the glow effect. Even then, it barely shows up. Plus, it could be frightening to an animal inside a glowing ball because he could not see the outside part and he could be a bit upset and scared. So while this is isn’t really a hit with the glowing thing, the hamster ball is still very good quality and nice for hamsters. What is a Wodent Wheel? Wodent wheels are safe running wheels for hamsters and other rodents. They are supposedly quieter than regular wheels and safer because they have a solid running surface. According to the manufacturer, Transoniq, these wheels were approved and recommended by the ASPCA during their Seal of Approval Program (1999 – 2006). Wodent wheels come in three sizes: Junior (8 inches diameter), Senior (11 inches diameter) and Wobust (12 inches diameter). I would say yes! I thought my regular wheels were already pretty quiet since they don’t make squeaking noises, but the Wodent Wheels were even quieter when used by my dwarf hamsters. I specify dwarf hamsters because when my Syrian uses it, it isn’t really quiet (although still better than a regular wheel). Although I’m using the Wodent Wheel Junior, it’s big enough for my Syrian and she seems to prefer it over her regular wheel. I just tried replacing the Wodent Wheel with her regular wheel again and she wouldn’t run on it (was trying to make a video). When I put the WW back, she went on it immediately o.O This is completely based on the preferences of one hamster though. The smallest wheel is 8 inches wide so it’ll probably not fit in smaller cages (i.e. Crittertrails or Habitrails). Also, they aren’t available everywhere so you’ll have to get them online. International shipping can get really pricey. You have to take them apart to clean them well, some people don’t like that but I don’t think that’s really a big deal. Transoniq also has a list of online dealers in the US as well as international dealers if you are in other countries.